Bullying can cast a dark cloud over the life of a kid, making normal, everyday school activities like walking to class or playing team sports feel threatening. Even their own home may feel unsafe. It may also impact the child's own behavior in a negative way. A new study suggests that being bullied can push some kids to lash out themselves, and that when the harassment involves both face-to-face and online taunts, the victim may respond with even more aggression. One mom from the suburbs outside New York City shared her daughter's story with CBS News, asking not to be identified because her daughter is still healing from the mental wounds of bullying. It began about four years ago, in fourth grade, when a classmate began harassing her. "It was verbal, by this one girl who basically everyone was afraid of because they didn't want to be her target," the mom said. She thinks her daughter was singled out by the girl because she is a "free spirit." "She doesn't follow the crowd. Everyone was trying to look mature and dressy, and she was still wearing kitty cats on her clothes," said the mom. "But then the teasing started right away from other kids." The verbal abuse from the bully escalated. "She belittled her person, her taste, her personality, how she speaks, her hair, everything," said the mom. Despite efforts to resolve the situation, the bullying continued and her daughter began acting out, fighting in the mornings before school because she didn't want to go. In fifth grade, things got even worse. The mom says her daughter was secretly filmed going to the bathroom by another child and the video ended up on a class social media site where kids chatted and shared images. The mom said her daughter's mental health was getting worse. "She would have anxiety attacks and become violent. I have holes in my wall." 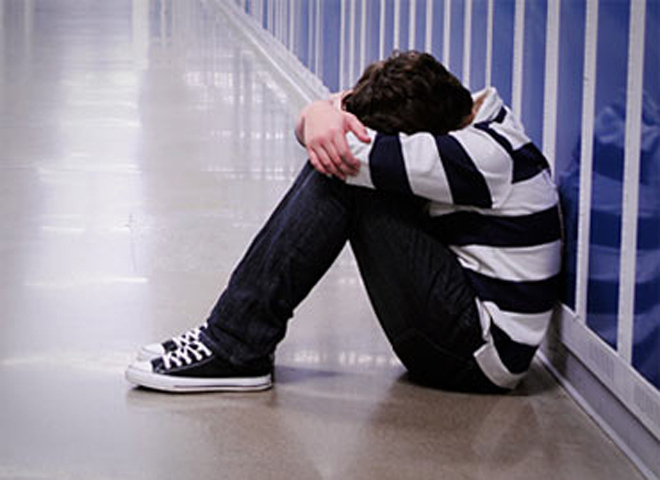 Research suggests that lashing out is not an uncommon response in kids who are bullied. Scientists from the Steven & Alexandra Cohen Children's Medical Center of New York analyzed existing data on U.S. children ages 10 to 17 and found that 43 percent had experienced face-to-face bullying and 7 percent had experienced cyberbullying, including text messages, social media and other types of online methods. Three percent reported suffering both types of bullying. Compared to kids who hadn't been bullied, victims of face-to-face bullying were four times more likely to exhibit aggressive behaviors themselves. And victims of cyberbullying were 10 times more likely to exhibit aggressive behaviors, the research revealed. Fighting, verbal hostility, property damage and peer coercion -- making another child do something they didn't want to do -- were some of the aggressive behaviors that bullied kids exhibited. But the researchers wanted to "connect the dots" and learn more about what happens when a child is bullied in both arenas -- in person and online -- said study author Dr. Andrew Adesman, chief of developmental and behavioral pediatrics at Cohen Children's Medical Center. When children were bullied both in person and online, their aggressive behaviors ratcheted up another notch. They were 38 times more likely to show aggressive behavior than kids who had not experienced bullying, said Adesman, who presented the findings Saturday at the Pediatric Academic Societies annual meeting in Baltimore. "They pay it forward," said Adesman. "Pay it forward typically has a positive connotation. Unfortunately in this case, it doesn't." It's often confusing for parents to know what to do when their child is being bullied -- especially when help from school officials isn't making a difference or is limited. After the video incident, the mom said, "My daughter had a nervous breakdown." She was hospitalized, and when she returned home, she refused to go to school for months. "I couldn't get her to go to school. She thought people were climbing in her window," said the mom. So she called a local crisis team and a psychologist came to house. While the mom said her daughter didn't bully other children as a result of being bullied, she did exhibit some violent behavior at home and to herself. Study author Adesman said their study on the effects of both forms of bullying was one of associations and more research is needed because it doesn't prove it's "causal." He said social media raises a challenging duality. "The same technology that allows us to share positive moments about ourselves also puts in the hands of less well-intentioned people the ability to share more hurtful things," Adesman said. Parents' awareness that bullying isn't limited to the school grounds is key to a child's well-being. "A kid can be in the sanctity of his bedroom and can be cyberbullied by one of his classmates," Adesman said. Previous research has also shown that bullied kids have a variety of emotional and behavioral reactions, said Dr. Louis Kraus, a member of the American Psychiatric Association's Council on Children, Adolescents and Their Families. "They're at a higher risk for adjustment reactions, depression, anxiety and behavioral issues," said Kraus, who is also chief of child and adolescent psychiatry at Rush University Medical Center. "Bullying is a group process. Even as adults, we all know what it's like to be ganged up on in the family or at work. With children who have far less coping strategies, it can be a devastating issue," he said. Whether it's in-person bullying or cyberbullying, parents or other adults need to intervene, Kraus said. In hindsight, the mom said, "I'd have done everything differently. If you notice any change in your child's behavior, if they're avoiding school, avoiding you, you need to get to an advocate." If the school has no resources, reach out further to a community advocacy group, which is where her family finally found help. Now age 13, her daughter has switched to a private school where she's caught up on the education she missed during her bullying crisis and the months away from school, but the family is still healing from the years of trauma.